Robert Pattinson is an English actor, model, musician and producer that was born on May 13, 1986, in Barnes, London, England, UK. 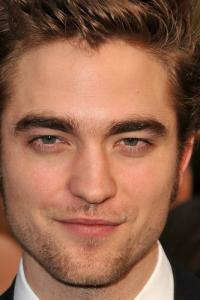 Robert is 6' 1" (1.85 m), and a few of his nicknames are Rob and R-Pattz. His trademarks are messy hair and thick eyebrows. His parents, Clare, who worked at a modeling agency, and Richard Pattinson, who was a vintage car importer named their son Robert Douglas Thomas Pattinson. He has two elder sisters, Victoria and Lizzy, who played dress up with him in their younger days where they would dress him up as a girl. Lizzy at the age of 25 had a top ten hit with the band Aurora and Victoria at the age of 27 who works in advertising. He grew up in the suburbs and attended Tower House School and The Harrodian School after the age of twelve. He also went to an amateur theatre at the Barnes Theatre Company where he auditioned and played a small role in Guys and Dolls. He went to being cast as George Gibbs when he auditioned for Thornton Wilder's Our Town. He later had roles in Anything Goes, Macbeth and Tess of the d'Urbervilles where he gained the attention of an acting agent leading him to look for professional roles. Robert started to take piano lessons at age three and classical guitar when he was five years old. He plays the guitar and piano very well and enjoys music immensely. His first big role in a movie was as Cedric Diggory in Harry Potter and the Goblet of Fire (2005) where he was recognized. He soon gained the leading role of Edward Cullen in the Twilight franchise consisting of five films between 2008 and 2012 which grossed over $3 billion worldwide. Robert became famous worldwide after the release of Twilight (2008) and became one of Hollywood's highest paid and most bankable actors. He went on to playing Salvador Dali in Little Ashes (2009), and a documentary titled Robsessed (2009) was released that same year starring Robert Pattinson and Charlotte Reather. He was once again praised for his role in The Twilight Saga: New Moon (2009) leading him to star in Remember Me (2010) as a troubled young man. Robert career took off and he appeared in several other movies including, The Twilight Saga: Eclipse (2010), Love & Distrust (2010), Water for Elephants (2011), The Twilight Saga: Breaking Dawn (2011), Bel Ami (2012), Cosmopolis (2012), The Twilight Saga: Breaking Dawn - Part 2 (2012), The Rover (2014), Maps to the Stars (2014), Queen of the Desert (2015), Life (2015), The Childhood of a Leader (2015), The Lost City of Z (2016), and Good Time (2016) which will be released soon. Robert started to model when he was 12-year-old, but it did not last long because his workload began to decrease when he was about 16 years old, and he thinks that is because of his masculine appearance. He said: "When I first started I was quite tall and looked like a girl, so I got lots of jobs because it was during that period where the androgynous look was cool. Then, I guess, I became too much of a guy, so I never got any more jobs. I had the most successful modelling career." He became the new face of Dior Homme fragrance in June 2013 and was featured in the advertising campaign titled 1000 LIVES. Photographer Nan Goldin released a book titled Robert Pattinson: 1000 Lives which contains a collection of Robert's images from the campaign. Robert is seen in Dior Homme campaign in January (2016) . - He composes and plays his own music. - He sang in the Twilight film series and How to Be (2008) which is independent comedy-drama. - He supports the GO Campaign, which is a nonprofit organization that funds and raises awareness to help orphans and underprivileged children worldwide. - Raises awareness about cancer and disease through Public service announcements. - He said his acting inspiration was from Jack Nicholson. - Robert invited one of his obsessed fans for dinner when he was having a bad day. - Sarah Barry Williams wrote a song titled "She wants to be Mrs Robert Pattinson". 2008 - ranked #23 on Moviefone's "The 25 Hottest Actors Under 25." 2008 - Hollywood Film Festival Award Committee chose him as the recipient of the 2008 New Hollywood Award. 2008 - received the Best Actor award for his performance as "Art" in the film How to Be (2008) at the Strasbourg Film festival. 2008 - Auditioned along with about 3,000 other people for the role of Edward Cullen in the movie Twilight (2008) and he got it. 2008 - He was named as Yahoo's Top Movie Heart Throb of 2008. 2008 - He was named as Rolling Stone Magazine's Hottest Actor of 2008. 2008 - Entertainment Tonight (1981) named him as their top hunk of 2008. 2008 - He was named as one of the LA Times Breakout Stars of 2008. 2008 - He was awarded Hello Magazine's Most Attractive Man Award of 2008. 2008 - He was one of People Magazine's Sexiest Men Alive 2008. 2009 - He was named AOL Moviefone's Sexiest Male Star of 2009. 2009 - GQ (UK) named him Best Dressed Man of 2009. 2010 - A wax statue of Robert Pattinson was added to the Madame Tussauds Museum in London and New York City. 2011 - Glamour Magazine - Ranked the #1 Sexiest Man in 2011. 2011, November 3 - Robert along with Twilight co-stars Kristen Stewart and Taylor Lautner put his signature along with their hand and footprints in wet concrete at Grauman's Chinese Theatre. 2015 - became ambassador to help raise international awareness of the non-profit organization.